This camera is a 35mm plastic kit camera that comes with an issue of a Japanese magazine. This amazingly well designed and implemented camera can shoot stereo images. It also can shoot normal 35mm images or wider panoramic images. I don't have any panoramas yet. They appear to be at most 30% wider than normal frames and suffer from sever light falloff. Not a feature I would use. The assembly instructions are all in Japanese, but have good diagrams. The same issue of the magazine had an article on homebrewed beer (in Japanese, of course), but did not have a corresponding starter kit! A printed sample image from this camera will be available for review with a stereo viewer at the workshop. Stereo images of Barrel Ridge near Searchlight, NV. This is a very dangerous hill to sit down on. 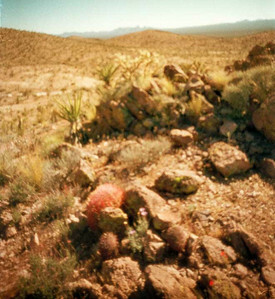 Standard pinhole image of some Mojave Desert flora. Note the Mojave Asters between the red barrel and the smaller Echinomastus cactus.